Zeke was one special member of our family. I got my little spit fire of life when he was only 2 months old. His previous owner told me he was a mix and that he was adorable. That's all I needed to know, to set my eyes on purchasing him. 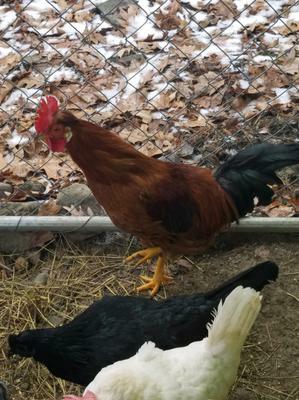 The previous owner told me that he was a hen, but he ended up being a rooster, and it was confirmed when he let out his first crow. He always had me on my toes with his energy and was always after the ladies of the house. 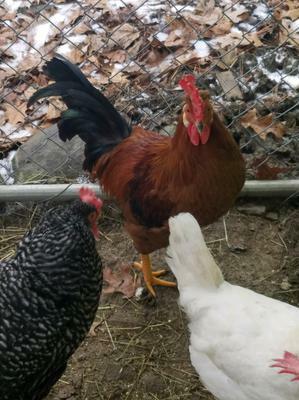 My husband and I thought he was Satan with the red in his eyes and we once thought of getting rid of him because he was drawing blood from our hens, but I refused to give up on him, and thought he was a newly raging rooster, and would tame down. He would always fight to be held, but he would pick the times I could hold him. He had 3 back toes on one foot and 2 on the other foot. He was surely unique in many ways. I am unsure of his breed to a 100% but I was told he was part Island Red and Polish. He had the most adorable little Mohawk and his comb folded all the way around, and met each other making him have a crown. Zeke was sure one of a kind. I am not sure how my Zeke passed. This morning 1/18/19 I opened the chicken coop just like I did everyday to let them roam, and Zeke was in the corner, all huddled up, dead. He had no injuries, and no type of blood coming from him. Everyone told me he must of been sick or broke his neck, but I refused to believe that. He was very strong willed Rooster. The way he was laying, looked so peaceful. I was the one who found Zeke dead. It was extremely heartbreaking. I was in shock at first because he was always so active, and the first one out of the coop. Seeing him lay there frozen stun me, and then I instantly began to cry. I didn't know how to take it as I haven't had chickens very long, I thought I may have done something wrong, like miss the warning signs if he was sick. None of my hens appeared to be sick, it was shocking and devastating at the same time. I guess the worse piece was when his "girlfriend" Jackie (as they were always together) was standing next to his dead body, almost like guarding it. It was heartbreaking for sure. It makes no sense to me why he passed. If I had any last words to say to Zeke they would be: I am sorry that I didn't watch over you better, I wasn't a very good mom to you, like I should have been. I have eggs in incubation, that are a little piece of you, and I hope that I am able to carry a piece of you through on a little chick. I know we haven't always seen eye to eye but you were family to me, and I will always have a piece of you in my heart. You will never be forgotten. I love you, son! Thank you for such a heartfelt memorial to Zeke, Stephanie. Please, don't blame yourself. Sometimes chickens die for no obvious reason. They are very good at keeping any illness hidden so they don't appear weak, and there really is nothing you could have done. Zeke was loved and well cared for, and many chickens do not have such a happy life. You did nothing wrong. I hope your chicks carry on Zeke's legacy well into the future.